Award-winning artist, choreographer, dancer, theater director and writer Bill T. Jones makes a rare Chicago appearance in a free presentation the DuSable Museum of African American History, 740 East 56th Place (57th Street and South Cottage Grove Avenue), Friday evening, January 27, at 7pm, in association with the Alphawood Foundation’s groundbreaking visual arts exhibition, Art AIDS America Chicago. Jones, a passionate HIV+ artist, will offer a one-night-only presentation with video, readings and photographs woven into the fabric of the evening. This program is free and open to the public; a $10 suggested donation will benefit the DuSable Museum. Advance registration is required and can be made by visiting here or calling (773) 947-0600. Jones’ oeuvre notably figures into the Art AIDS America Chicago exhibition, a powerful collection of 170+ contemporary works which is currently on display at the new Alphawood Gallery (2401 N. Halsted Street, Chicago) through April 2. Among these works exploring artistic responses to AIDS is Deborah Kass’ Still Here, part of a group of paintings called Feel Good Paintings for Feel Bad Times, which use an exaggerated typography to underscore the gulf between the literal and metaphorical significance of their chosen phrases. The words Still Here come from both the Stephen Sondheim musical Follies in which a faded film star recalls how she persevered (“Good times and bum times, I’ve seen them all, and, my dear, I’m still here.”) and from Jones’ 1994 magnum opus, Still/Here, a dance about perseverance, dying and HIV. 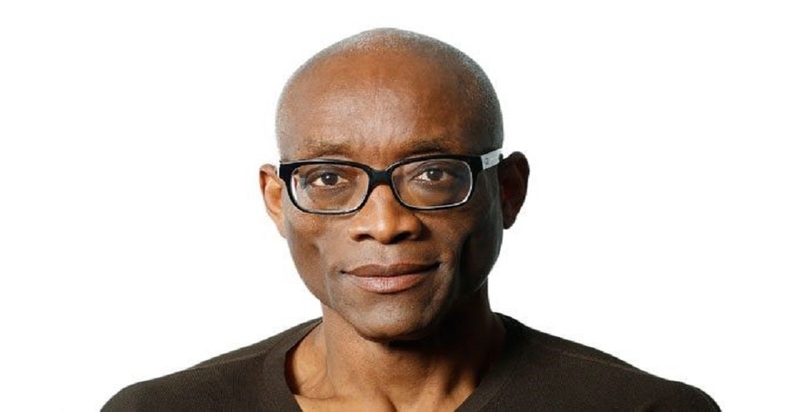 Bill T. Jones, 64, has received myriad major honors ranging from the Human Rights Campaign’s 2016 Visibility Award and 2013 National Medal of Arts to a 1994 MacArthur “Genius” Award and Kennedy Center Honors in 2010. Jones was honored with the 2014 Doris Duke Performing Artist Award, recognized as Officier de l’Ordre des Arts et des Lettres by the French government in 2010, inducted into the American Academy of Arts & Sciences in 2009 and named “An Irreplaceable Dance Treasure” by the Dance Heritage Coalition in 2000. His ventures into Broadway theater resulted in a 2010 Tony Award for Best Choreography in the critically-acclaimed FELA!, the new musical he co-conceived, co-wrote, directed and choreographed. He also earned a 2007 Tony Award for Best Choreography in Spring Awakening as well as an Obie Award for the show’s 2006 off-Broadway run. His choreography for the off-Broadway production of The Seven earned him a 2006 Lucille Lortel Award. Jones began his dance training at the State University of New York at Binghamton (SUNY), where he studied classical ballet and modern dance. After living in Amsterdam, Jones returned to SUNY, where he became co-founder of the American Dance Asylum in 1973. In 1982 he formed the Bill T. Jones/Arnie Zane Company (then called Bill T. Jones/Arnie Zane & Company) with his late partner, Arnie Zane. Jones is currently Artistic Director of New York Lives Arts, an organization that strives to create a robust framework in support of the nation’s dance and movement-based artists through new approaches to producing, presenting and educating. For more information on Jones or the company, please visit www.newyorklivearts.org. The DuSable Museum is just one of the numerous local arts and advocacy allies hosting events in association with the presentation of Art AIDS America Chicago. In addition, through the run of the exhibition, the Alphawood Gallery, itself, will offers engaging programming related to issues raised by the content of the exhibition, from artistic inclusion to activism, health to history. All in-gallery programming — artist & expert talks, panel discussions, performances, gallery tours, and HIV testing — is free and open to the public. For the most current listing of off-site and in-gallery programming, please visit http://www.artaidsamericachicago.org/events/ often. This is the first exhibition to explore how the AIDS crisis forever changed American art. Since the first reports of mysterious illnesses in the early 1980s, HIV and AIDS have touched nearly every American in some way, and operated as an undeniable, though often unacknowledged, force in shaping politics, medicine, culture and society. While acknowledging and honoring the enormous anger, loss and grief generated by the epidemic, the exhibition refutes the narrative that AIDS is only a tragic tangent in American art. Instead, Art AIDS America offers a story of resilience and beauty revealed through the visual arts, and of the communities that gathered to bring hope and change in the face of a devastating disease. Art AIDS America Chicago is the local – and largest – iteration of this groundbreaking national exhibition which underscores the deep and unforgettable presence of HIV in American art. The exhibition features some 170+ significant contemporary works on display at the Alphawood Gallery, a temporary space created in a former bank by the Alphawood Foundation to bring the exhibition to its only Midwest venue. The Alphawood Foundation, a Chicago-based, grant-making private foundation working for an equitable, just and humane society, is proudly presenting Art AIDS America here. Each year the Foundation awards grants to organizations, primarily in the areas of advocacy, architecture and preservation, the arts and arts education, promotion and protection of the rights of LGBT citizens and people living with HIV/AIDS, and other human and civil rights. The exhibition was originally organized by Tacoma Art Museum in partnership with The Bronx Museum of the Arts, where it was on display until September 25, 2016. The exhibition is co-curated by Jonathan Katz and Rock Hushka, chief curator and curator of contemporary and Northwest art at Tacoma Art Museum. Major support for the exhibition and catalogue has been provided by The Andy Warhol Foundation for the Visual Arts and The Paul G. Allen Family Foundation. Additional support for the U.S. tour was provided by the Leslie-Lohman Museum of Gay and Lesbian Art and by Gilead Sciences. The Chicago presentation of the exhibition and related programming are made possible by the Alphawood Foundation. Art AIDS America Chicago is open Wednesdays and Thursdays from 11am – 8pm, and Fridays, Saturdays and Sundays from 11am -6pm. Admission to the Alphawood Gallery is free; however, to ensure entry, timed admission passes may be reserved by visiting ArtAIDSAmericaChicago.org. Walk-ups will be available on a limited basis. The Gallery is conveniently located at 2401 N. Halsted in Chicago near the CTA Fullerton ‘L’ stop, as well as several CTA bus routes. Limited free parking is available in an adjacent parking lot, along with more plentiful metered street parking and garage parking nearby. For more information and updates, please visit ArtAIDSAmericaChicago.org as well as Facebook, Twitter, and Instagram.